Date With a Camel shaving soap is a luxury shave soap made with real Camel Milk and locally, grown dates. The stable lather makes for a smooth shave. Matching Aftershave is included. Date With a Camel shaving soap is a luxury shave soap made with real Camel Milk and locally, grown dates. Camel milk contains alpha-hydroxy acids and is higher in Copper, Iron, Magnesium, Manganese, Potassium, Sugars, Vitamin C and Zinc. It also contains long chain of fatty acids for a gentler shave. I use the dried date powder from local dates for extra lathering capabilities. Sourced from local ingredients, my handmade 5 oz shaving soaps come in wide mouth jars. I use natural oils and butters for a luxury soap that is truly extraordinary. It is made the old-fashioned way for a truly enjoyable experience. The stable lather that you get from Date With A Camel shave soap is incredible and makes for a sudsy, silky, smooth shave. Camel milk contains more fat then cow’s milk and more sugars for richer, long lasting lather. Offers great lubrication during shaving and makes a great glide with a safety razor which reduces irritation. It is very easy to produce a dense lather with a quality shaving brush. This is thirsty soap that loves water! The scent contains notes of bamboo, sugar cane, grapefruit, ripe plum, citrus and a touch of Litsea. My shaving soaps do not contain parabens or sulfates. This is the desert's secret for a smooth, shaving experience. 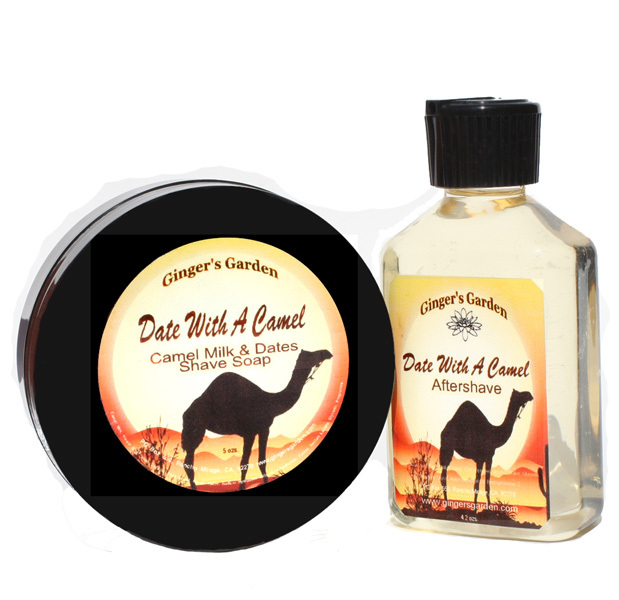 Help keep your skin healthy with Date With a Camel Shaving Soap. This is a set with a Shave Soap and a matching After Shave. Shaving Soap Ingredients: Camel Milk, Tallow (Sodium Tallowate), Stearic Acid, Olive (Olea Europaea oil), Coconut (Cocos Nucifera oil), Palm Kernel (Elaeis Guinensis oil), Mango Butter (Mangifera Indica), Castor (Ricinus Communis oil), Sodium Hydroxide, Potassium Hydroxide, Beeswax (Cera Alba), Date Powder, Fragrance. Aftershave ingredients: Aloe Vera Juice, Witch Hazel, FDA approved alcohol, Water, Glycerin, Propylene Glycol, Fragrance, Menthol, Benzophenone -2.